The positive effect of the hard bargained,(but half heartedly taken, measures of expanding the ESFS to € 1000 billion was short lived. The Greek PM saw himself facing an angry population, when they struck at the heart of their national celebration, Friday 28th October (OHI Day). This apparently lead to what we refer to in the Netherlands as "panic football", when he announced to call for a referendum to the Greek people. Two days later I saw a headline that the cost of this announced amounted to more than $ 1800 billion, world wide, as expressed in the MSCI World Index. How to find these figures? Datastream provides figures on this index. The easiest way is to open the navigator en perform a free text search: "msci world index". 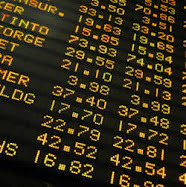 The best bet is MSCI WORLD U$ (mnemonic MSWRLD$).